1-1 Based on your system voltage, you must first decide which battery is needed and how many to use in order to meet your requirements. For example, you may connect a series of eight 6V batteries, six 8V batteries or four 12V batteries for a 48-volt system. The size of your battery compartment, your performance requirements and costs may limit your options. 1-2 Make sure there is enough space between batteries to allow for minor battery expansion that occurs during use and to allow proper airflow to keep battery temperature down in hot environments. System Capacity = 225AH To increase capacity, connect batteries in parallel. This will not increase the system voltage. System Capacity = 225AH + 225AH = 450AH To increase both voltage and capacity, connect additional batteries in series and parallel. To increase voltage, connect batteries in series. To increase amp-hour capacity, connect batteries in parallel. To increase both voltage and amp-hour capacity, connect batteries in series/parallel. 2-1 When choosing your battery model, first consider your battery compartment space, as this may limit your options. Within your size restrictions you may have several battery options to choose from. For example, you can use a T-605, T-105 or T-125 in the same space, as they are the exact same physical size. The difference between these batteries is the amount of energy they offer. 2-2 Next consider your energy needs. If replacing an existing battery, use it as a reference point. If your old battery provided enough energy, it can be replaced with a similar capacity battery. If you need more energy you can size up, or if you need less energy you can size down. 3-1 Finally determine which terminal option best meets your needs based on the type of cable connections you plan to use. Look for the terminal(s) available for the battery you have selected. During storage, monitor the specific gravity (flooded) or voltage. Batteries in storage should be given a boost charge when they show a 70% charge or less. See Table 1 in the Testing Section. Correct the charging voltage to compensate for temperatures above or below 77°F (25°C). Subtract 0.0028 volt per cell for every 1°F (0.005 volt per cell for every 1°C) above 77°F (25°C) or add 0.0028 volt per cell for every 1°F (0.005 volt per cell for every 1°C) below 77°F (25°C). 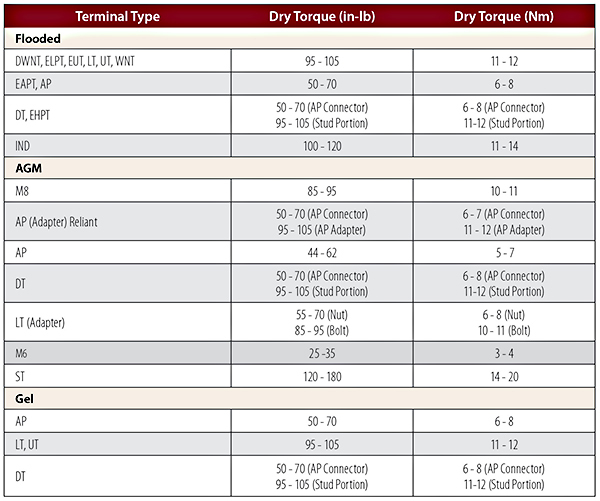 Set charger for the equalizing voltage (See Table 2 in the Charging section). If your charger doesn’t have an equalization mode, you can unplug the charger and re-plug it back in. This also will conduct the equalization charge. 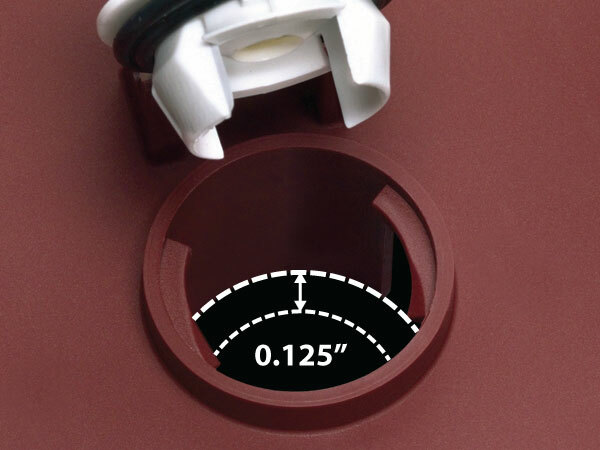 Add water to 0.125″ below bottom of the vent well. Add water to the maximum water level indicator.